MEN JEG TROR IKKE AT JEG FAKTISK HAR SKADET NOEN. MEN DU ER IKKE HELT SIKKER? MESTEPARTEN AV TIDEN, FÅR JEG BARE OFRENE VEKK DERFRA KJAPT. GORDON, JEG SIER DEG, JEG ER FORSIKTIG. KANSKJE DU ER FORSIKTIG, KANSKJE IKKE, MEN JEG BEKLAGER, VI KAN IKKE LA DEG FORTSETTE Å GJØRE DETTE. KYLE, DU MÅ LEGGE TIL DET MITCH FORTALTE OSS I NOTATET. BUT I DON’T THINK I’VE EVER REALLY HURT ANYBODY. MOST OF THE TIMES, I JUST GET THE VICTIMS OUT OF THERE FAST. GORDON, I’M TELLING YOU, I’M CAREFUL. MAYBE YOU ARE CAREFUL, MAYBE YOU AREN’T, BUT I’M SORRY, WE CAN’T LET YOU KEEP DOING THIS. KYLE, YOU NEED TO ADD WHAT MITCH TOLD US TO THE NOTE. Well, now. That’s one way to deal with it. This week, over at the Patreon Page, we hit another Milestone Goal. 🙂 That meant we unlocked the background for the Full Monty Tsunami Pin-up! So! 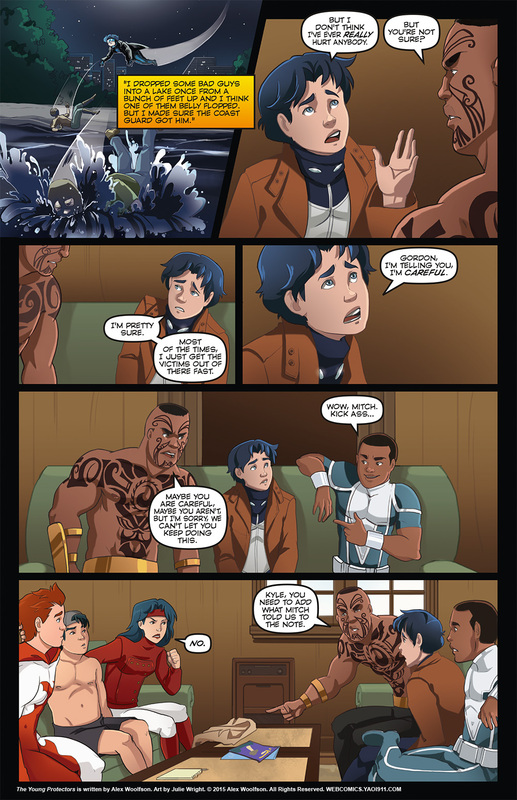 Tsunami’s got a plan to keep Mitch and others from harm, but Commander doesn’t seem too pleased with that idea. Will Tsunami be able to convince her? Should he?